Take it from the pro – it is great for the soul! Tom Howell, Willie Martin and fellow Springmoor putters will agree. On a late Monday morning, you will find a group of men and women gathered on the “Springmoor CC Putting Green” to play a round of 18. Closest to the Pin, Hole in One and Lowest Score is what this group competes in each time they are together. Scores are never important but a little competition certainly makes it more fun. Tom was asked recently to design a new golf card. His fellow golfers told him they needed something a little more official – this is an important part of the game and the details are necessary. Now the card has the length of each putt and the handicap level. 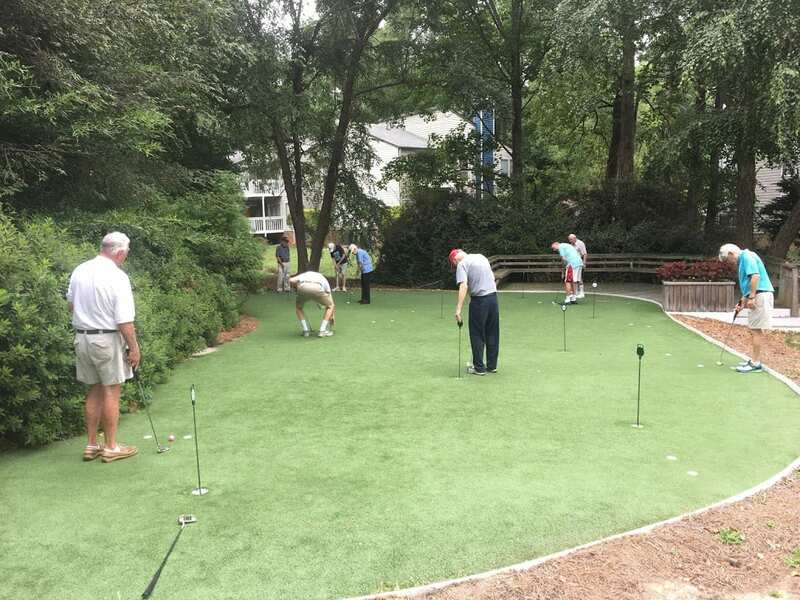 The putting green has 9 holes and they will play it twice for a competitive round of golf. They play every other Monday at 11:00. Brandon Hair, Springmoor’s Executive Director, joined the group during his first few months on the job. He made a hole in one on the closest to the pin putt and won a bag of cookies! The rest of the group trades places on the leader board every other week. Esther Wenzel and Joan Speir, the stars of the women’s team, give the men a run for their money with their putting skills. Don Preiss can be found practicing more than anyone. He loves the sport! New resident Murphy Osborne has recently joined the group and has found his way to the top on many occasions. 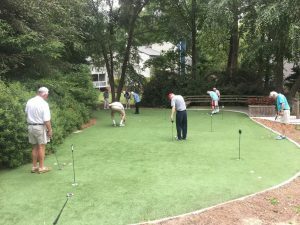 Closest to the pin – who’s the winner? Asked how they find new golfers, Tom says it’s not hard. The Welcoming Committee is quick to point them in the right direction. He and Willie get calls from someone on the committee or are spotted at dinner and handed a list of who needs to be invited to play. There are some upcoming residents on the Waiting List that have joined the Monday game too. If the group wants to play a full round with sand traps, water and long fairways they can head down Creedmoor Road. Wildwood Green Golf Club is only five minutes from Springmoor. They offer a great senior rate Monday thru Thursday, any time of the day. Tom says the location can’t be beat! Five minutes away and you’re on the golf course – what’s better than that? And if it’s raining, he invites you to join him at the Billiards Table. 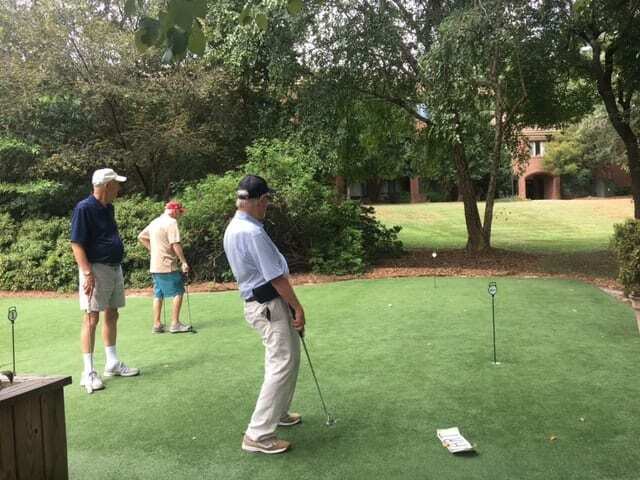 Dale Matzinger, our North Carolina Senior Games Ping Pong Champion, signed up for the Wake County Senior Games this summer and encouraged Tom to try this sport too. 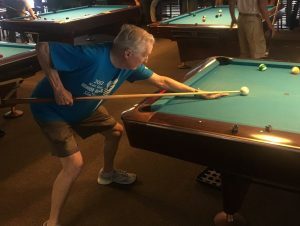 Armed with a rules book, the two have gotten a lively group of Billiard players together and mastered the Senior Rules of the game. The newly renovated room in North Village has also become the hub of jigsaw puzzle fans. The two groups share lots of laughs together. 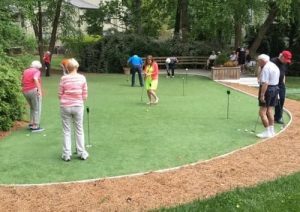 There is also a lively game of croquet each week – the South Village offers a beautiful court just outside the Bistro. 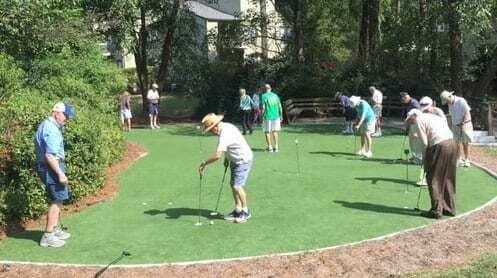 There are a few putters that play croquet on Saturdays. Whatever your sport – from Ping-Pong to putting greens – there are always opportunities to compete, to share a few laughs and to exercise.